New York Fashion week just ended and I was invited to a couple of fabulous events featuring several new trends. After reading dozens of articles, blog posts, and press releases, I rounded up a few of (what I think) are the most wearable fashions. 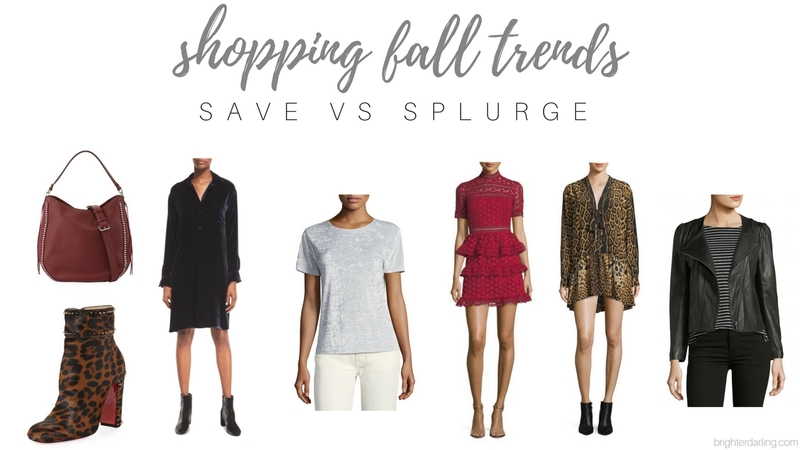 To make it a little more fun, I did a little save vs splurge fall fashion trends comparison! Ready to check out my favorite fall looks to recreate? Out of the tons of fashion forward looks I saw during New York Fashion Week – everything from flip-flops and floral to plaid and glitter – I stayed on the tamer side of things. My favorites included red (a color I normally shy away from), velvet, leopard print, leather and the high neck line. Shop the looks by simply hovering over the image and click to go directly to the retailer. Super simple! Personally, I’m such a sucker for the leopard booties and the velvet shirt dress. I also picked up the $39.99 faux leather jacket myself and loving it, also. Both of those can be worn with nearly anything and look effortlessly cool. What’s been your favorite fall/winter trend so far? It’s hard to believe we’re already in mid-September with the weather still in the 80s (even up here in New Jersey). Hoping it cools off soon so I can rock some more of these fall fashion items and share how I styled them. Stay tuned for a save vs splurge fall beauty trends 2017 coming soon! "Favorite Fall Fashion Staples As Told By 5 Bloggers"
"Like A Green Juice For Clear Balanced Skin | BioClarity Review"